IN ‘The Goose Girl', subject of one of George Cruikshank's most charming illustrations, the brothers Grimm tell the story of a lovely young princess riding with her personal maid to the city where she is to marry a royal prince. The maid threatens to kill her, usurps her clothes and her horse ‘Falada', and successfully impersonates her in the royal apartments; the princess is sent off with the boy Curdken to mind the royal geese. Frightened that the horse may tell what has happened, the imposter has it beheaded. But ‘when the true princess heard of it she wept', and begged the man to nail up Falada's head against a large dark gate in the city through which she had to pass every morning and evening, that she might still see him sometimes. Then the slaughterer said he would do as she wished, cut off the head, and nailed it fast under the dark gate. nothing better than that she should be thrown into a cask stuck round with sharp nails, and that two white horses should be put to it, and should drag it from street to street till she is dead. This, the reader infers, is arranged and a satisfactory royal wedding then takes place, after which the happy couple rule ‘in peace and happiness all their lives'. It was from this characteristically bloody and imaginative ‘German Popular Story' that the author of The Drinker took his lifelong pseudonym, marking it as his own by inserting a second ‘l' and wryly adopting the forename of that other Grimm unfortunate, the simpleton who is swindled again and again and convinces himself each time that he is ‘Hans in Luck'. But the name Fallada also recalls a poem by a slightly younger writer from the opposite end of Germany, Berthold Brecht. For he too made use of it just after the First World War for his description of a dying carthorse whose still live body is carved up by hungry Berliners, naming his powerful poem ‘Falada, Falada, there thou art hanging'. Twelve years later, at another moment of desperate crisis in Germany, when the Weimar Republic was about to fall into the lap of Adolf Hitler, Brecht turned the same poem into a revue sketch with a reporter interviewing the horse under the heading ‘A Horse Accuses'. This is not to say that there was any tangible link between the great political poet and the outwardly unpolitical novelist Rudolf Ditzen who took the name Fallada. We do not even know if they knew one another's works. But Hans Fallada was at once the probing reporter and the bleeding, accusing dying horse. Psychologically disturbed from an early age, he had felt the need to cloak his own identity after writing his first, Expressionist-style novel of a disturbed and self-destructive adolescence, whose publication in 1920 not only shocked and hurt but might also, he feared, disgrace the name of his father, a strict and upright north German judge. Yet he developed slowly, and it was not until the publication of The Drinker that his rare combination of objective curiosity and extreme personal despair became plain for all to read. All my life long I have fed on people. I have stored them in my mind along with their ways of moving, speaking, feeling, and now I have them there, ready for instant use. Nothing has ever interested me so much as the realization why people behave as they do. My otherwise hopeless memory is excellent for each detail, the most trivial facts that I learn about the habits of my fellow men. By then he had shed the egocentric mannerisms of his two earliest books, emerging at the end of the nineteen twenties as a compelling story-teller, a writer without frills whose interest in the lower levels of society made him one of the most successful authors of the coolly critical movement known as ‘new matter-of-factness' or ‘Die Neue Sachlichkeit'. Of the sixteen books which he published from 1931 to 1943, his most productive years, seven were more or less instantly translated into English; their German sales by now run into millions. 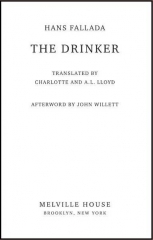 Yet they remain very remote from what German criticism slightingly terms ‘Trivialliteratur', and with the writing of The Drinker at the end of that time Fallada showed the deeply pessimistic basis of his readability. Indeed he can be seen as a paradigm of his country's moods between the establishment of the Weimar Republic and the end of Hitler's Third Reich: its moments of rational, systematic illumination and its terrifying plunges into the dark. How, we may wonder, could a writer come to unify such extremes? Just twenty-one when the Great War broke out in August 1914, Fallada was already determined on a literary career. His father, the future Supreme Court judge, would have liked him to grow up with the same strict concepts of duty, justice and precision as he himself tried to exemplify; his much younger mother, daughter of a protestant pastor, seems always to have been a subordinate figure. Their son however was incorrigibly awkward and accident-prone, and although the family circle was apparently a close-knit, cultivated one, he did badly at school, was more than once dangerously ill, suffered from masturbation guilt, and had a penchant for self-destructive adventures which led his despairing parents to seek medical help before he was eighteen. All this culminated in an unprovoked and irrational duel with one of his few friends, which ended with him killing the friend under still obscure circumstances and then trying to shoot himself. At the same time he had become an obsessive reader, starting with that great adventure story of solitude, Robinson Crusoe, but soon turning to those more adult books which he had secretly discovered in his father's library: the works of Flaubert, Daudet and Zola (before he was twelve, he later claimed), Dickens, Dostoevsky and other great nineteenth-century writers. These were not at all the sort of literature that Judge Ditzen wished him to read, yet on the other hand he was formally denied the synthetic Westerns of Karl May so beloved of his more frivolous contemporaries. It was indeed a belated act of revolt when Fallada celebrated his eventual success as a writer by buying the whole set of May's works and reading all sixty-five of them, in some cases more than once. His own literary ambitions seem to have been encouraged in the first place by his aunt Adelaide Ditzen, a gifted spinster then living in Rome as a medical secretary, who came to the rescue after the tragic duel and offered to look after him in the Leipzig criminal lunatic asylum to which he was consigned. She started teaching him English, French and Italian, and introduced him to the work of Romain Rolland, to whom he then wrote offering his services as a translator. Though it seems that Rolland knew the aunt (who had an interesting circle of literary acquaintances that included Nietzsche and Malwida von Meysenbug), the only result at first was a series of rejections from leading German publishers. Then, on his release from the asylum, less than a year before the war, he was sent, once again at the aunt's suggestion, to learn farming and estate management with a neighbouring landowner in the hope that the country life would further his recovery. This did not proceed entirely smoothly, partly because the story of the duel caught up with him, and partly because on his volunteering for the army in August 1914 he was rapidly discharged as mentally unfit. But it did determine his primary profession for the next fifteen years, and undoubtedly it also served the further purpose suggested to him by his aunt: providing him with a wide range of human and social material to observe and note. What she had not foreseen was the vicissitudes through which his experiences of German (and very largely Prussian) rural economy would take him. First came his work as a specialist in the potato business, which brought him to Berlin in the crucial war years 1916-17, where he was introduced to fashionable Expressionist circles and the use of morphine; this was when he wrote Der junge Goedeschal, the work for which he changed his name, an unsuccessful and (for him) untypical ego-novel about his school miseries and fiascos. Then came short spells on various estates, interrupted by periods of treatment in clinics. Then, with the apparent abandonment – or at least postponement – of his writing ambitions, his addictions led him to start fiddling his employers' accounts, with the result that he was twice sent to prison, the first time for two months in the north German university town of Greifswald, where he had been born; the second for a term of two and a half years in the big prison at Neumunster near Kiel. Morphine, alcohol and cigarettes (between 120 and 200 a day, according to his biographer Tom Crepon) had together come to provide what he called his ‘little death', that combination of oblivion and elevation which would seduce him off and on throughout the rest of his life. At first it looked as if his second term of imprisonment might have cured him of this, and he wrote hoping to renew his links with Ernst Rowohlt, the publisher of Goedeschal, who had by now rejected Expressionism and become a leading promoter of Die Neue Sachlichkeit. There was no answer. Meanwhile he started trying to make a living addressing envelopes in Hamburg, where he came into contact with the socialist movement through the Issels, a working-class family whose storekeeper daughter became his wife and principal moral support right up to the events outlined in The Drinker. Late in 1928, even before the engagement had been announced, his parents helped him to buy himself into local journalism back in Neumunster, and, after a difficult time spent canvassing for advertisements, he got rid of his publisher/employer by denouncing him to the local Socialist mayor for misuse of election funds. As the new editor of the Neumunster ‘Advertiser' Fallada was a close observer of the prolonged dispute between the Schleswig-Holstein farmers and the Socialist-led administration, one of the key conflicts of that critical time, and in the summer of 1929 he and his wife went to the North Sea island of Sylt on a facility trip which accidentally brought them face to face in the dunes with Ernst Rowohlt. These events at last established Fallada as a writer. For Rowohlt suggested that he should come to Berlin at the beginning of the new year to take a part-time job in his publishing firm, and this in turn allowed Fallada to revise and complete the novel which he had begun writing about the farmers' campaign. The result was the publication in spring 1931 of Bauern, Bonzen und Bomben (a title that can be loosely rendered as ‘Farmers, Functionaries and Fireworks'), the first of what we now see as his characteristic books. Unlike its three immediate successors this was not translated into English, but the BBC transmission of Egon Monk's film version in the nineteen seventies will not have been forgotten by those who saw it, while in Germany the book stood out in a year remarkable for the publication of Erich Kastner's Fabian, the premieres of Zuckmayer's Captain of Kopenick and Pabst's film of The Threepenny Opera, as well as the closing on economic grounds of Klemperer's radical Kroll Opera. It sold well (though Fallada's royalty payments were held up when the Rowohlt firm had to go into temporary liquidation during the 1931 bank closures), was serialized in the Kolner Illustrierte before publication, and was soon regarded along with Kastner's poems and Egon Erwin Kisch's reportages as typical of literary Neue Sachlichkeit. It was another Rowohlt writer of this trend, the satirical journalist and cabaret poet Kurt Tucholsky, whose long review in the Weltbuhne best analysed what seemed so exceptional about this regenerated novelist's talents. The technique is straightforward; it is good old Naturalism, slightly short on imagination, but then the author is not claiming to have written a great work of imaginative literature … This is no artistic masterpiece. But it is genuine, so uncannily genuine that it gives you the shivers … It is written by someone who knows that particular world like the back of his hand, yet can keep exactly the right distance needed to depict it..: close, but not too close. that we have no comparable novels about doctors, or stockbrokers, or the big city; it's as though the members of those lofty strata of the bourgeoisie have no eyes in their heads to see what is going on around them. No doubt they take it too much for granted. Fallada has seen. and then been concerned to observe my decline, but kept a glimmer of belief in my star none the less – there weren't many of them, alas, but they welcomed Suse with pleasure and affection, as if she had always belonged with them. I hope you realize that your prospect is one of financial insecurity, that I am in bad health, that I can and must give you no children, that I have been rejected by my social class. But their son was born in Berlin a year later, and a daughter and another son would follow. and write the first line, I am lost, a compelling force is in command. That force dictates just how and how much I must write, whether I want to or not, even if it makes me ill. Good resolutions, the most sincere promises, go by the board – I must write … A hundred times I have wondered what it is that drives me so. in the middle of my writing I start realizing that I'm almost through. Suddenly the material is exhausted. Everything I was still planning, scenes I had imagined, turn out not to be needed, the novel has rounded itself off. It is finished. With great reluctance and many delays, he sets himself to revise and type his longhand manuscript, then to correct it once more with the aid of his wife. Once published he only wants to forget it. Review articles are destroyed before he can see them, and ‘never', he claims, ‘have I been able to bring myself to reread a single line in any book of mine once it has appeared'. So he worked in the period between Farmers, Functionaries and Fireworks and The Drinker, the greater part of which was spent in the lake-strewn north German countryside at Carwitz near Feldberg, halfway between Greifswald and Berlin. Here he lived the life of a beekeeper and small landowner, interrupted by occasional newspaper contributions and, once or twice each year, the blindly compulsive writing of a novel. Certain features of the books would recur: the mistrustful, often devious country-people; the generous yet worldly wise girls of the urban working class; the escape from the city to the land; the untrustworthy gentry; the policemen and criminal types whom he had known in prison; the sometimes appalling bourgeois mothers and widows. The particular tilt or balance could not be foreseen; it varied from book to book. And if we include his two wartime installments of gently fictionalized autobiography, he wrote eighteen of his twenty-five books in those ten years. Then came the break which resulted in the present work. Before leaving Berlin, at the height of his country's economic and political crisis, he had written the most famous of all his books, the story of a young shop assistant who becomes forced into poverty with his pregnant working-class wife. The employers are Jewish, the wife's father an old Social Democrat, her brother a Communist, a fellow-employee a Nazi; the ground seems to have been prepared for a social, if not actually political novel of the last days of the Weimar Republic. But if this was the intention it got modified in the course of the writing, for as soon as the scene shifts from the provinces to Berlin the wife's family drops out, new eccentric characters appear – drawn with something of the same affectionate understanding as Christopher Isherwood's Mr Norris three years later – and although the precariousness of the couple's life is shown in convincing monetary detail, the solutions offered are limited to a combination of lucky windfalls (of more or less fishy origin) and mutual love. Even the presentation of the book is ambiguous, for while its original cloth covers bore two characteristic (if irrelevant) drawings by George Grosz, the title, thought up in a session dominated by the publisher, was the trivializing question Kleiner Mann-was nun? : Little Man, What Now? It was a worldwide success, an American Book of the Month Club choice in 1933, a film directed by Fritz Wendhausen the same year, the first paperbook published by Rowohlt after the Second World War; it was praised by Thomas Mann, Carl Zuckmayer, Jakob Wassermann, Hermann Hesse and others; and it incidentally set the Rowohlt firm afloat once more after the crisis of 1931. And much of its success was due to the tender portrayal of the wife ‘Lammchen' – clearly based on the personality of Suse Issel – and to that combination of humour, sentiment and a certain self-pitying resignation which lies in the popular German notion of ‘the little man'. Naturally the pressure was on Fallada to repeat it, and he decided to base its successor Wer einmal aus dem Blechnapf frißt (Who Once Eats out of the Tin Bowl) on his prison experiences. Before he could get properly started however, Adolf Hitler came to power, and the subsequent burning of the Reichstag on 27 February 1933 marked the end of parliamentary government, the suppression of all opposition to Hitler's National Socialist (or ‘Nazi') party, and the inauguration of the aggressive dictatorship known as the Third Reich. Briefly Fallada was arrested, on the more or less instinctive suspicions of his neighbours in the commuter belt east of Berlin where he and his wife had hoped to buy a house. This was no great setback, for during the twelve days which he spent in the local gaol he wrote systematically, and Rowohlt quickly secured his release. But his wife was nearing the end of her second, more difficult pregnancy; the Grosz drawings had to be removed from Little Man, What Now? in favour of a feeble drawing of a smiling young couple with their child (by one Walter Muller); and a move right into the country seemed advisable. For any reputable writer the climate and the working conditions had plainly changed. There were still six years to go before Hitler led his country into war, and five more till the final bursting of Fallada's self-constriction with the writing of The Drinker. He never wished to emigrate, and appeared critical of those who did. He continued producing his books with much the same fitful fluency as he had shown in the last years of the republic. But when he completed the prison novel at the end of November 1933 he thought it prudent to damp down some of the details and add an apologetic foreword just in case the new regime took exception. And he almost instantly felt driven to start another long novel – some 540 pages in the German original – reflecting the loss of one of the twin girls that his wife had meanwhile borne, but at the same time giving the portrait of an egocentric male-chauvinist north German farmer deeply rooted in his ancestral soil. This took a mere three weeks to write and seemed to the author a great step forward in his work. Yet the odd thing was that, whereas Who Once Eats out of the Tin Bowl, for all his fears, was at first well received, the new book Wir hatten mal ein Kind (Once We Had a Child), with its tear-jerking title and its ideologically timely mixture of masculine dominance and blood-and-soil ruralism, was the subject of a campaign to demolish his reputation by the party purists. It seemed then that it was useless for him to make concessions, whether deliberate or unconscious, to the Nazi New Order: for, as the official Völkischer Beobachter put it, ‘He was never one of ours.' Early in 1935 he again took to drinking. In August he had to show his ‘Ahnenpass' (the disgusting booklet that revealed whether one had racially pure ancestors or not); in September the Propaganda Ministry declared him ‘unacceptable' and forbade him to publish abroad; and although this was rescinded, that winter he more than once had to go into a sanatorium. None the less his narrative power and his ability to create characters had not left him, and he had a large readership and a supportive publisher. So he decided to set his sights lower, but to stay put and continue writing-stories, articles, light novels like Altes Herz geht auf die Reise (Old Heart Goes on a Journey, which became an Ufa film), and endearing but essentially cosy works like his two warm-hearted books of reminiscence. In the second half of the decade, too, he translated two successful and eminently compatible light works from America, Clarence Day's Life With Father and Life With Mother. It was proposed by Rowohlt and the popular film director Willy Fritsch, with the backing of Goebbels and his Propaganda Ministry, that he should write a film story for the actor Emil Jannings, but the film was stopped, allegedly because Alfred Rosenberg and his ideological purists found Fallada's involvement unacceptable, while the novel version Der eiserne Gustav (Iron Gustav) was doctored to give it a Nazi ending. And yet it was during these years of self-censorship and official mistrust that he managed to write and publish, seemingly without official interference, the two-volume novel Wolf unter Wolfen (Wolf Among Wolves) which he wrote in two bursts of intense creativity covering ten months of 1936/37. This is a large scale, pitiless portrayal of the state of the German countryside in the early years of the Weimar Republic, with vivid pictures of those Nationalist, anti-Communist groups and individuals who were paving the way for fascism during the great inflation of 1922/23. Published in September 1937 at the height of the Nazi campaign against degenerate art, perhaps only a political innocent could have ventured to write it – or else an extraordinarily sensitive political subconscious. One friendly speaker on Berlin Radio even compared it with Dante's Inferno and Balzac's La Comédie humaine, adding that it could be seen as more impressive than either, since ‘it deals with an Inferno which we have all been through'. Though it finally lapses into a trusting optimism, it is not merely Fallada's finest achievement but perhaps the one great novel to have appeared under Hitler's Third Reich. first made me what I have become, she taught an aimless man how to work, a desperate man how to hope. It was thanks to her faith, her loyalty, her patience that we managed to build up what we now possess, what we rejoice in every day. And it all came about without much talk, or fuss, or finger-wagging, but simply by her being there and sticking to me through good times and bad. Now however he had turned against her influence and wrote, apparently in secret, this relentless first-person story (the only one among all his main novels) about a provincial provision dealer who falls out with the capable wife on whom everybody thinks he depends, starts obsessively drinking, becomes besotted with the waitress whom he calls his reine d'alcool, and from that point starts dropping irrevocably, through a richly squalid series of subsidiary tales and episodes, to the horrible bottom of his society. How much of this is hallucination, how much imagination – the reader thinks of Kafka's In the Penal Colony – how much reality? What is its basis in the author's own experience, what in the life of his country in the last year of the war? Not published till after the Nazi surrender – in the Federal Republic in 1950, in the GDR three years later – it was written in the autumn of 1944, and it marks the catastrophic ending of Fallada's most fruitful period. The war was then nearing its end, with the Russians advancing through Poland and Romania, and the Western Allies in France and Belgium. The Propaganda Ministry had listed him as undesirable; Rowohlt had been expelled from the official Chamber of Culture and gone into the army: during 1943 he was discharged as ‘politically unreliable' and his firm, already ‘gleichgeschaltet' (or incorporated in the officially-approved system), finally closed down. Though the Labour Service briefly commissioned Fallada to come and report on their activities in occupied France and Czechoslovakia, he was now once again drinking himself stupid and seems to have written nothing, possibly because he did not much like what he saw. What was much worse for him was that just at this juncture a smart, seemingly unattached Berlin woman arrived in Feldberg who not only reminded him of his chief Berlin attachment at the end of the earlier war, but was also an alcoholic and a morphine addict. Already in matrimonial trouble because of an affair with his family's au pair girl, he now became hopelessly involved with this Ulla or ‘Uschi', with the immediate result that he and his wife divorced by mutual agreement. Then on his first visit home there was a quarrel during which he loosed off two shots from a half-forgotten gun, and was carried away to a closely guarded criminal asylum in the neighbouring city of Alt-Strelitz on a charge of attempted murder. 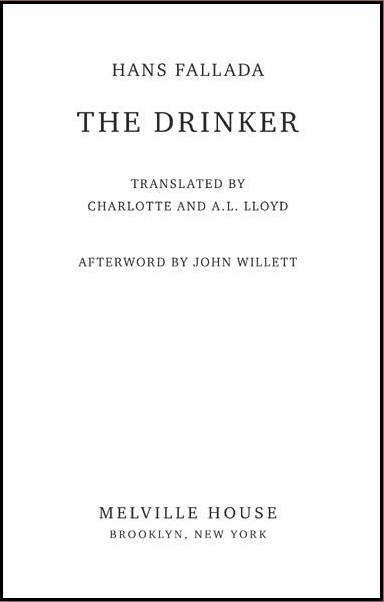 It was there that, under the pretence of writing a propaganda novel, he wrote The Drinker, not in code as has sometimes been suggested, but in fine criss-crossed lines to economize paper. Dates in the margin of the original show that it took him a fortnight. But man gets used to anything, and I am afraid that perhaps he gets used quickest of all to living in a state of degradation. in the oppressive atmosphere of fascism, Fallada lost that inner confidence in his feelings which – for all his lack of firmly pondered and held views – characterized his initial critique of society. then he surely will have felt a sense of shame as well as resentment. How we take The Drinker today, then, depends in some measure on our view of its author's attitude to the Third Reich. Personally uncommunicative, at least in his stable moods, he gave no evidence of courage but had a complex kind of obstinacy none the less. He was never pro-Nazi; he was unwilling to leave Germany; he would not risk any form of resistance. Tom Crepon, whose mildly fictionalized East German biography of 1978 was written with Suse Ditzen's aid and approval, reports a visit of May 1934 by the younger Rowohlt with Martha Dodd and Mildred Harnack, the American who joined the ‘Red Orchestra' group with her husband Arvid and Harro Schultz-Boysen, and was beheaded in 1943. She asked Fallada if it was still possible to write as one wished, and when he said yes, if you were prepared to compromise on unimportant points, she turned away, remarking ‘What is important, what is not?'. Martha Dodd's conclusion was that Fallada had resigned himself, and was content in his new isolation. Yet clearly this contentment had worn through by the middle of the Second World War, and if the deterioration of his marriage was a major factor so was his plain incompatibility with the system. These two elements in his decline seem to have aggravated one another, to judge from the timing of his lapses. Thus it appears to have been a particularly severe blow when the Rowohlt firm was finally closed down, not least because its offence had been to publish such ‘undesirable' authors as the cabaret poet Joachim Ringelnatz (who had died in 1934) and Fallada himself. It was this that led to the (unfulfilled) commission from another publisher to write the anti-semitic ‘Kutisker' book. That the picture of the asylum given in The Drinker stands for more than the bare events of the author's own incarceration is clear, since it helped that he was imagined to be at work on the ‘Kutisker' job, and he was in fact released after less than four months. Unexpectedly, in view of his announced intention to return to his wife, he then married the disastrous Uschi, with whom he would spend his last two years. These saw the breakdown of all his resolutions as they shared the ‘little death' of their renewed addictions, first in her Feldberg house near his own and then in her flat in the ruins of Berlin; and the incoherence of their life together from then on seems reflected in the incoherence of his first, largely autobiographical postwar novel Der Alpdruck (The Nightmare), which actually appeared before The Drinker and proved much harder to write. It was the first time since the nineteen twenties that Fallada had lost his grip on the reader. Yet in its scrappy way the book gives a convincing impression of the arrival of the Red Army in Feldberg and the moral collapse of the inhabitants, and describes with a certain irony the circumstances that led to its author – who would never have accepted, nor perhaps been offered, public office under Hitler – being installed as mayor of Feldberg for four months till his strength gave out. Thereafter he looked for literary and journalistic contacts in Berlin, and found them again among the Soviet occupiers and their helpers, notably the poet Johannes R. Becher who had returned from emigration in Moscow to head the Kulturbund (or League of Culture) which the Russians sponsored, initially in all four sectors of the city. Becher knew Fallada's work from before 1933, and happened to have come from a curiously similar background: a stiff-collared lawyer father, a suicide pact where only the other partner died, a period of Expressionist excess (including a morphine addiction) and a sobering-up process, governed in Becher's case by a political discipline. He now sought out Fallada, helped him to find occasional work with the Soviet German-language Berlin daily Taglicher Rundschau, got him preferential rations and housing and, at a Christmas party in 1945, introduced him to the Soviet writer Konstantin Fedin and the chairman of the German Communist Party, Wilhelm Pieck. By the former's account Fallada was still maintaining his isolation, for he disagreed with Pieck about his party's optimistic expectations of the German workers and the probable impact on them of the Nuremberg War Crimes trials, saying finally that ‘the business of the politician is to obey reality; the business of the artist, to portray that reality as it is'. A month or two earlier Becher had passed him a collection of documents taken from the Berlin Gestapo and the People's Court, providing details of the case against an obscure working-class couple who from 1940 to 1942 had conducted their own private propaganda campaign against Hitler, then been caught and executed. His objective all along, it seems, was to reactivate the narrative writer whom his Moscow colleague Georg Lukacs had judged ‘one of the greatest hopes of German literature', and see if Fallada could not produce that major novel of the Third Reich for which the country – and indeed the world – were waiting. I, the author of a novel which has yet to be written, hope that their struggle, their suffering, their death were not entirely in vain. But as he came to plan that novel he became doubtful, first estimating its length as a ‘paltry three hundred pages', then abandoning it on the ground that the material could only justify an essay of twenty typed pages and anyway ‘who still wants to read about that kind of thing?' In the end he signed a contract for the film version with the East German state film company, DEFA, and with Uschi absent again in hospital wrote the 540-page Jeder stirbt fur sich allein (Everyone dies for himself alone) in a mere twenty-four days, an achievement to match those of his great period. The result was not only more than Becher could have hoped for; it is one of Fallada's best novels, with a great gallery of well-observed characters, both men and women, ranging from the old civil servant to the smart young SA-men and the shabbiest Gestapo informers. Who would have thought that either the resigned and untalkative Fallada of 1934 or the shattered personality of The Drinker could so sensitively penetrate under the skin of the police state? Right-thinking German literary criticism is still uncertain where to shelve Hans Fallada: Expressionism or Entertainment, Nazi or anti-Nazi, GDR or Federal Republic? – like so many of the most interesting writers he cannot be placed under an exact label. Yet he has his position in modern literary history alongside Kastner and Anna Seghers, Tucholsky and Plievier, Renn and Remarque, as part of the new sobriety of the later nineteen twenties, and counterpart to equivalents such as Rudolf Schlichter and Paul Hindemith in the other arts. Like Feuchtwanger's Success, moreover, and Döblin's Berlin Alexanderplatz, a number of his novels can be read as adjuncts to history proper, clues to the changing society of their particular place and time. Thus Farmers, Functionaries and Fireworks and Wolf Among Wolves bring life to the generally neglected story of Hitler's rise to power in the provinces; Who Once Eats out of the Tin Bowl has been called the best novel of prison life under the Weimar Republic; Little Man, What Now? joins Fabian and the Isherwood Berlin stories as pictures of the Republic's last months; while the final novel is a perceptive account of oppression and a feeling tribute to the old-style individualism of the Berlin working class. And The Drinker? It springs like a blow in the midriff from the bombast, false folksiness and anodyne classicism of National Socialist culture, and it is hard not to take its steady descent into the pit as a parable – less specific than the big novels but all the more shocking – of Germany's march into the depths. If there is an English analogy here it is with Evelyn Waugh, whose opinions and actions are by no means progressive or universally admired, yet who wrote a handful of books that share much the same conflicting qualities as Fallada's. Thus whatever the nature of Waugh's professed view of English society and of the issues for which it was fighting in the nineteen forties, it did not stop him from producing the extraordinarily revealing trilogy about the Second World War for which he will long be read. And similarly, in Wolf Among Wolves and Jeder stirbt fur sich allein the awkward misfit Fallada achieved something that an admirable, humane, intelligent, constructively-disposed, much less anguished-looking ‘inner emigrant' like Erich Kastner never, so far as is known, even attempted: a large-scale critique of the reality around him. But the obvious comparison to be made with Waugh relates to that author's The Ordeal of Gilbert Pinfold, the critically observed, largely satirical account of a middle-aged man's fantasies which reads as a brilliant work of the imagination. Like The Drinker it is not quite that, for, as Francis Donaldson showed us in her Portrait of a Country Neighbour, it closely reflects a very strange period in Waugh's life when he was haunted simultaneously by the ‘black box' of fringe medicine and by a team of BBC interviewers, and began drugging himself with soporifics. Pinfold in other words was rooted in a peculiar kind of reality outside normal experience, just as Fallada's hallucinatory novel is rooted in his breakdown of 1944. Both books can be read without any knowledge of their background in the real world of their authors' lives, both are set down objectively without a preconceived display of moral, religious or political prejudices and principles; if anything they are likely to extend, if not actually conflict with the reader's prior ideas about the writer in question. For both imply a lot about their country, and both are relevant to the remainder of their author's writing. Is it then illuminating to know the true biographical and psychological setting? Is it a help to the reader? Does it matter? Despite what Tucholsky and others said about Fallada's failure to write an ‘artistic masterpiece', one of the main lessons of Neue Sachlichkeit is that there is nothing inartistic about authenticity; the artistry lies not in the style but in the way that authenticity is structured and handled. Moreover there is not much – at least in Western societies – that does more damage to our contemporary arts than the assumption that a work cannot be serious if it is clearly, even simply expressed, reflects reality and holds the attention of its audience. What distinguishes the writings of artists like Waugh and Fallada, then, from those trivial entertainers whom, in sales terms, they may be thought to rival is their ability to select, however unconsciously, from the real world round them and treat their material imaginatively but honestly, without distortion. The shape, the play of continuity and contrast, the element of timing involved in exciting narrative or masterly poetry, these are what needs to be brought to bear on the writer's experience if it is to appeal to the reader's imagination, and not just to his or her appetite for random facts. The artist who can bring this off is worth study, for the secret of his success has to be looked for in some particular relationship between his gifts, the breadth of his experience and his individual development as a person. Admirable as they are, niceness and morality are not what determines this; we are struck in the first place by the artistic success, which we may sense quite naively, then feel that its deeper reasons must need exploring, and go on to find a new sympathy with the actual personality together with all its weaknesses and faults. Indeed we may even think we hate or despise a writer, yet wish very much to know them better because we see that beyond this superficial reaction there is a unity between the individual and his or her achievement that demands to be understood. Nowhere is this more the case than when an extraordinary work is created out of extraordinary suffering, particularly when the means seem so ordinary and direct as those which Fallada uses. We are back to the goose girl of German popular tradition. The writer is beheaded, the writer reports. Bleeding reality becomes material for the imagination. There are not two heads for the passer-by to look at but one.